Thanks for joining me on my journey through the land of BricsCAD. Today’s excursion takes us on a tour of editing tools. 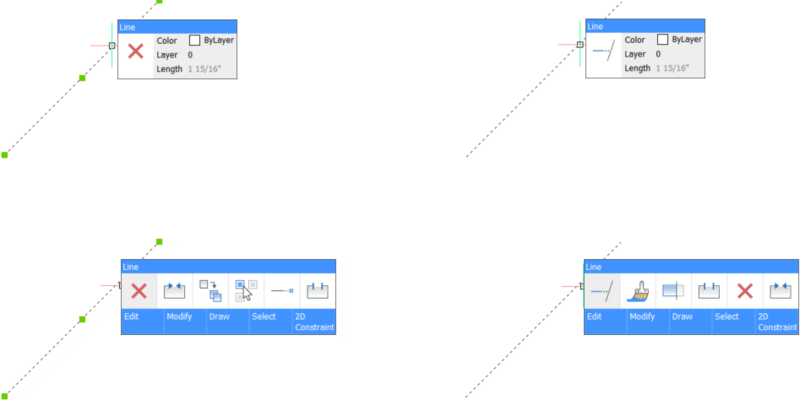 Like AutoCAD®, BricsCAD offers multiple ways to edit entities. Some of the most common methods are with the Properties panel, grips, and the Quad. 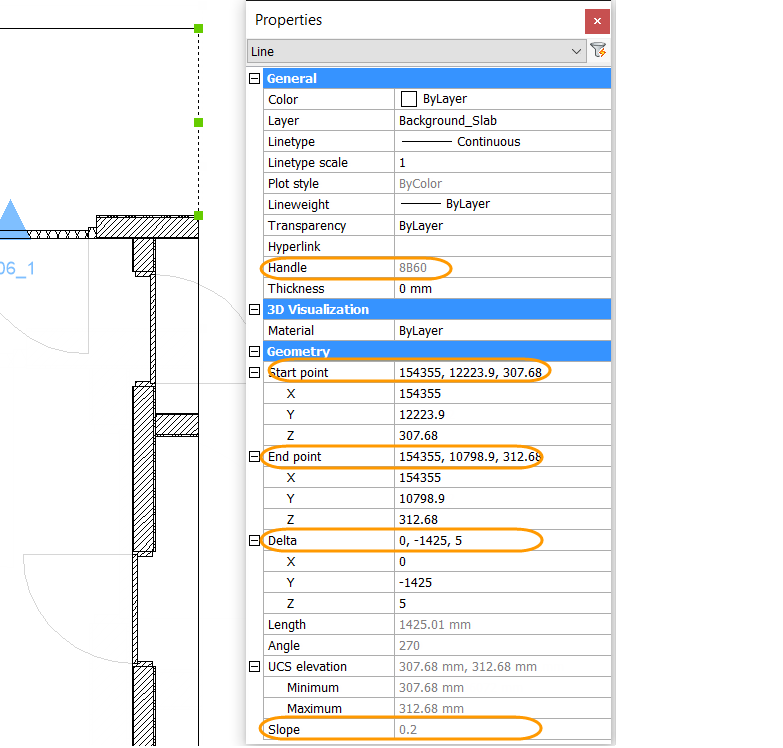 BricsCAD offers a Properties panel like the Properties palette in AutoCAD. You can access it with the PROPERTIES command (PR alias) as well as other methods such as double-clicking on an object. Since it’s a panel, it can remain open while you work. The properties displayed in the panel vary depending on the type of object(s) that you’ve selected. In general, they match what you would expect from your AutoCAD experience. There are, however, a few notable differences. For example, the Properties panel in BricsCAD displays the Handle (read-only) of the selected entity. The entity’s handle can be useful to store and recall for programing purposes. You’ll find other valuable additions to the Properties panel for different objects. I can’t possibly cover all of them, but below is an example of properties for a selected line. In BricsCAD you can edit a line by entering the x,y,z values of the start point, end point, or even the delta. It also displays the slope as a read-only value. While this is supposed to be a 2D drawing, it’s obvious from the slope of the selected line, that this particular entity isn’t flat. You could, of course, edit the z-value of its endpoint to match the start point. However, you may incorrectly assume its accuracy beyond the second decimal place. Instead, you can change the Delta z-value to 0 ensuring the line is truly flat! BricsCAD supports traditional object grips like AutoCAD. For example, if you select a circle, you can use its center and quadrant grips to move or resize it. BricsCAD does not, however, support mutli-functional grips. Instead, much of that functionality is available on the Edit tab of the Quad. As I mentioned in a previous post, the Quad offers different edit tools based on the type of entity. 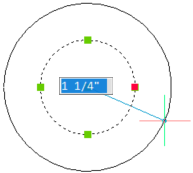 Circle edit tools are quite different, for example, from Dimension edit tools. 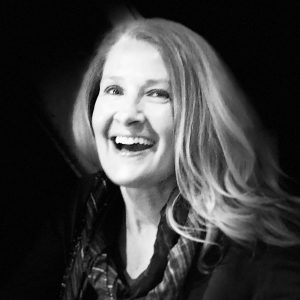 When you select a dimension, you’re offered tools to modify the dimension or dimension text. For example, you can flip the dimension arrowhead nearest to where you selected the dimension. In contrast, Circle edit tab includes tools like Trim and Hatch. The default tool changes based on your most recent editing behavior for that type of entity. You can hover over the default tool to display additional recently used tools. The recent tools can vary depending if you select the entity or simply hovered over it. Pass the cursor over a tab at the bottom of the Quad to expand it with even more tools. You’ll find the most common tools to edit that specific type of entity on the Edit tab. The tools may vary depending if you select the entity or simply hover over it. For example, if you select a line, the Edit tab displays the Lengthen, Break, Join, and Match tools. If you hover over a line, without selecting it, the Quad adds Trim and Extend to the tool set. 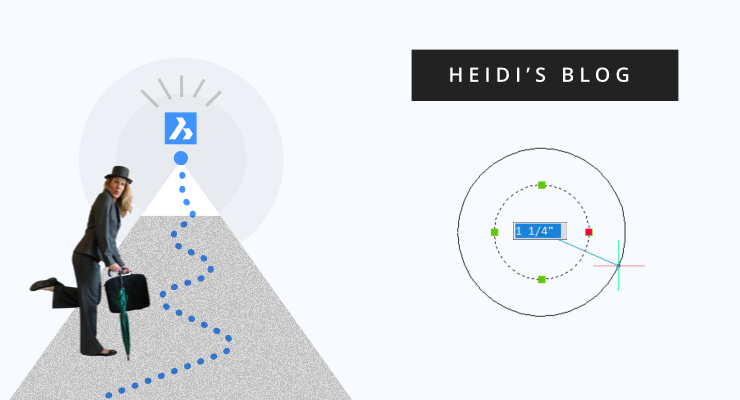 In this example, if you hover over the line and use the Extend tool, BricsCAD automatically extends the highlighted entity to the nearest boundary based on where you hovered the cursor. It only takes one pick compared to three picks and two enters using traditional methods. Of course, traditional methods are still available. I shared just a few examples of the intelligence and contextuality of the Quad. In addition to the powerful default behavior, you can customize the Quad to meet your needs. I promise to show you how in a future post. In this post we reviewed tools to edit entities; altering their appearance. Next time we’ll explore tools to manipulate entities within the context of the rest of the drawing.